The wet and windy weather conditions of the last few weeks have caused many homeowners to think about their roofs. Thankfully, those with wood roofs have an expert they can turn to with all of their questions and concerns. The Cedar Roof Company, of Malvern, specializes in the installation, preservation and repair of cedar shake and shingle roofs. 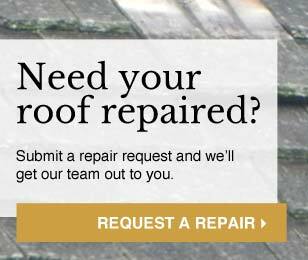 It is, in fact, the only company in southeastern Pennsylvania with a service department dedicated to maintaining and repairing wood roofs. Though many homeowners panic when they see evidence of a leak, co-owner Brian Pott believes that the most important thing they should understand is that there is rarely pressure to make a quick decision about the replacement of a roof. “Even a visible leak can be fixed temporarily,” he says, “in order to allow a customer adequate time to consider their options.” Mike Malone, head of installation for The Cedar Roof Company, also notes that leaks which appear during wind-driven rainstorms may be limited to that isolated event, and he always suggests a conservative approach to repair. Pott and Malone suggest homeowners receive an evaluation of their wood roof whether they are having a problem or not, in order to help them assess its current condition and future progression. They encourage customers to be present during the assessment when, according to Pott, his company can provide insight and discuss the options available to the homeowner. “We believe that providing education about our services, products and the contracting industry is the honest and professional way to assist homeowners,” he says. “You will learn more about your wood roof by viewing it with a professional than you would by reading any proposal.” The company’s informative website also provides detailed explanations of these topics. 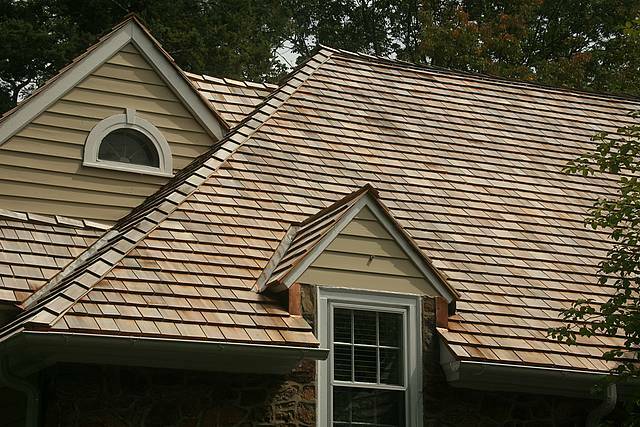 Cedar is a beautiful and durable roofing material that can add value to a home with its many benefits. It is a classic material, indigenous to North America and used in the construction of some of the country’s oldest and most elegant communities, but there are also practical reasons for its use. It is naturally rot resistant, sustainably harvested, completely renewable and biodegradable. Its wind and impact resistance prevent damage in weather conditions such as those caused by last month’s hurricane. Wood comes in a range of lengths, thickness and grades, installed with different amounts reveal. Malone explains that these are some of the variables that affect price and longevity of a roof and should be detailed on any estimate. “Cedar represents itself well,” he says. “It always looks great, but that does not necessarily mean it has been installed correctly.” All of The Cedar Roof Company’s installations are built to code and above. This includes lining the roof valleys with ice and water shield, wrapping pipe vents, skylights and chimneys and using top-grade stainless steel fasteners. The company also offers clients a complete package of services, such as the installation of gutters and gutter guards to accompany their installation, maintenance or repair. The main enemies of wood roofs are sunlight and moisture; water penetrates the wood, causes swelling and then the sun dries it, causing damage including cupping, curling and splitting. If not removed, moss harbors moisture which leads to rot and in time can require significant repair or even replacement. Preservation makes economic sense. One of The Cedar Roof Company’s mottos is “Preserve It Now, Replace It Later.” Treatment can begin as early as 10 months to a year after installation and needs to be repeated every five to six years. 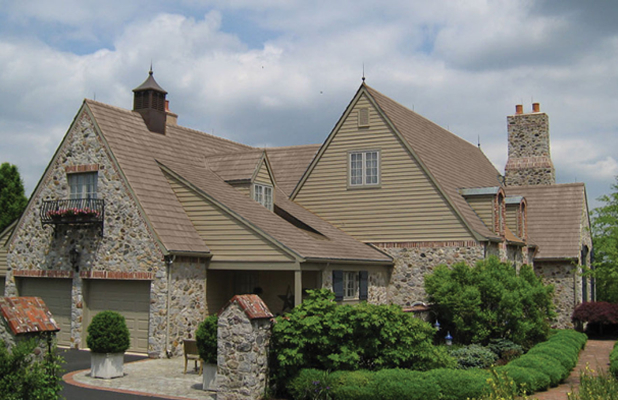 After a thorough cleaning, a wood preservative specifically designed for cedar roofs is applied in one of three natural cedar color selections. This treatment provides UV and moisture protection to prevent damage and control decay. 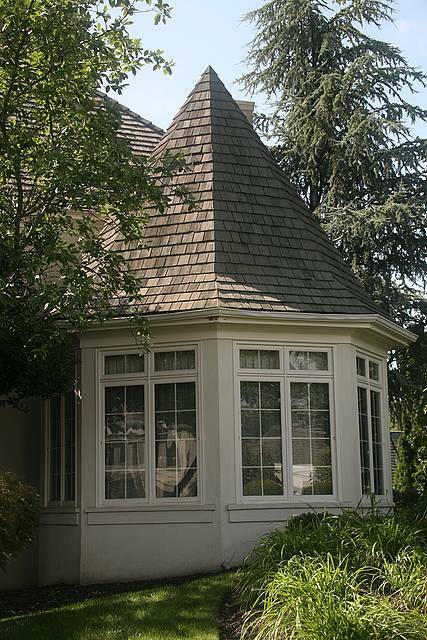 Proper maintenance will preserve the condition and appearance of a wood roof, thereby protecting the investment. Installation clients who have their new roofs preserved within the recommended timeframe will earn a five-year extension on the Quality Craftsmanship Warranty on any of The Cedar Roof Company’s standard system roofs. Pott is passionate about this business. “We want to create a customer who will be with us for the life of the home,” he says. 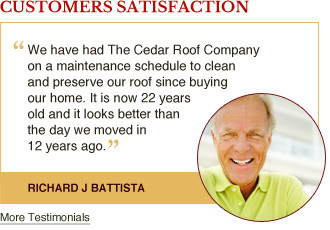 The Cedar Roof Company’s reputation and qualifications have earned satisfied customers in several states. The company services clients in Pennsylvania, New Jersey, Delaware, southern New York and Connecticut, but loyal clients have asked the company to care for their vacation homes as far away as Maine.